This ice cream recipe is completely dairy-free, of course. It calls for coconut milk and some of that amazing homemade almond milk you made when I posted the recipe and video last week. If you haven’t made your own, you can use store-bought plain unsweetened almond milk instead. This recipe also uses surprisingly little sugar, since the berries add their own sweetness, and the sugar it does contain is whole cane sugar, which is an unrefined whole food (more information below). Do you have an ice cream maker yet? If not, I highly recommend it. They really aren’t that expensive and they work amazingly well. It’s a worthwhile investment. They sell them on Amazon, or go to Bed, Bath & Beyond and bring your 20% off coupon. I know you have one, and those things never expire, they’re just trying to get you in the store sooner by printing a date on there. That’s another thing my mom taught me. 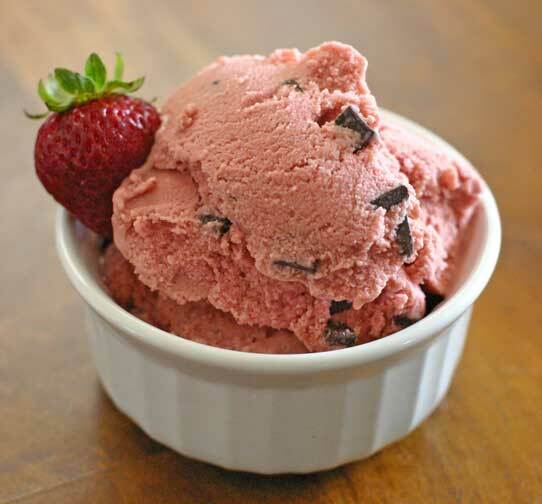 You don’t often see the flavor “strawberry chocolate chip” in stores or ice cream shops, which I find perplexing because everyone loves chocolate-covered strawberries, don’t they? It’s a perfect combination. It’s not too hard to find dark chocolate or semi-sweet chips that don’t contain milk products. Just check the ingredients. There are some explicitly vegan brands out there, too, such as Enjoy Life. But if you have trouble finding them, you could always chop up your own dark chocolate bar into little chunks and use those. Put the ice cream maker bucket in the freezer at least 24 hours before you’ll be making your ice cream, so it’ll be frozen solid when it comes time to use it. I turn my freezer down a degree or two when freezing the bucket as well, which helps, because it’s 115°F in Las Vegas and 84° in my kitchen, and if the bucket is not completely frozen, the ice cream will not freeze during the churning process. 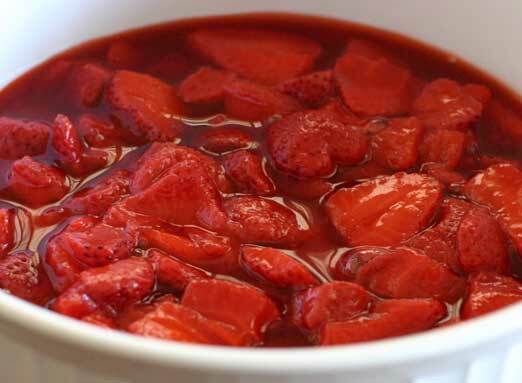 Wash and slice the strawberries, toss them into a bowl, pour in the lime juice and agave syrup, and then stir thoroughly. Allow the berries to macerate this way for several hours, stirring from time to time. You can allow them to sit overnight; just cover and put them in the fridge. Heat the almond milk in a saucepan over low heat, then add the sugar and stir until it dissolves. Transfer to a large bowl, stir in the coconut milk and vanilla extract, and place the bowl in the refrigerator for a few hours until the ingredients are cold. Helpful tip: If your can of coconut milk has separated into cream and water when you open it (it will appear to be solid at the top of the can if this has happened), don’t worry, it hasn’t gone bad. 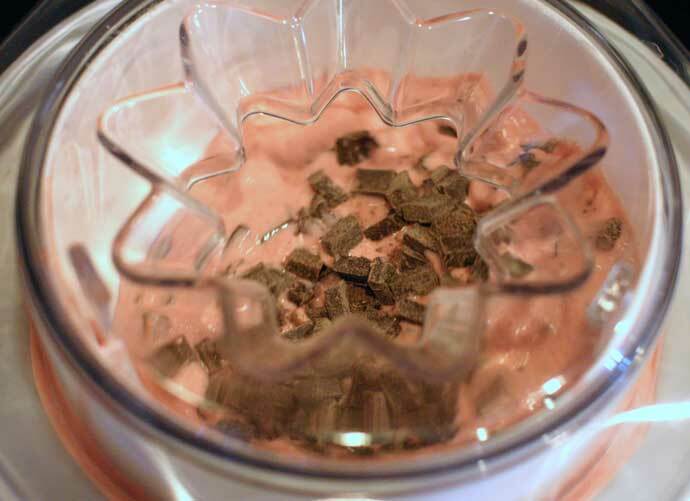 Pour the whole thing into a Magic Bullet cup and blend for about ten seconds, or stick a fork in the can and whip it up by hand (but I have to warn you: it’s really easy to spill if you choose the manual method). 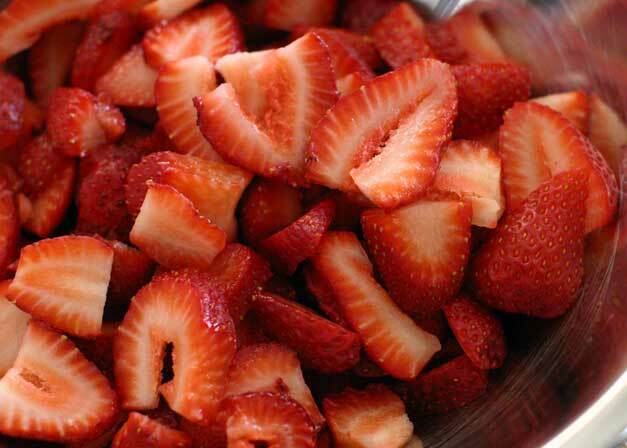 Pour the macerated strawberries into a blender and purée them into a syrup, then put that in the fridge as well. Wait until all of your ingredients are completely cold before you begin the final step, and work quickly once you remove them from the refrigerator. Pour the strawberry syrup into the large bowl of milk and stir well, then transfer the whole thing to the ice cream maker and allow the machine to work its magic according to the manufacturer’s instructions. In the last few minutes of processing, pour in the chocolate chips, and let the mixture churn until the chips appear to be evenly distributed through the ice cream. Transfer the ice cream to a freezer-safe container and store in the freezer until you’re ready to serve it. I recommend scooping yourself a bowl right out of the machine, though, because it has that delicious melty consistency right after it’s made that will make your eyes roll into the back of your head as soon as it hits your tongue. Yum! Whole cane sugar, sometimes also referred to as sucanat, rapadura, panela or muscovado, is an alternative sweetener that some people consider to be a health food. Alternative to what? The refined white sugar we all know so well. Whole cane sugar has not gone through a refining, separation or bleaching process; it has simply been filtered, dried and ground and is therefore a whole food. The sugar still contains its molasses, so it is brown and imparts a distinct caramel-like flavor to anything it is added to. 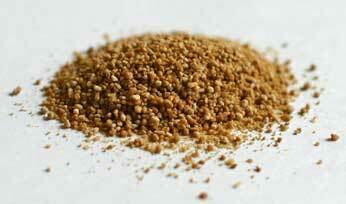 It also retains some vitamins and minerals, where refined sugar is nutritionally empty. Some people believe that using whole cane sugar in place of white sugar keeps the glycemic index of the food lower, meaning that it is metabolized more slowly and doesn’t spike blood sugar levels quite as much as refined sugar. High blood sugar levels are associated with weight gain and ultimately obesity and diabetes, hence the concern. While this may be true to a small extent, make no mistake: whole cane sugar is not a diabetic-friendly food; it’s still sugar. Remember, I’m not an expert, just a layperson interested in improving my health, but my personal opinion is this: I keep my sugar intake (including whole cane sugar) pretty low overall. Most of the sugar in my diet comes in the form of whole fruits. On the other hand, I believe in enjoying life in general, and specifically the occasional dessert, so I don’t rule out sugar entirely. If I’m baking or, in this case, making my own ice cream, I prefer to use whole cane sugar because it is a whole food and therefore closer to its natural state. Now that I’m used to avoiding refined sugar, I find that when I do eat some, it leaves a bad aftertaste in my mouth and seems to trigger subsequent sugar cravings, whereas when I use whole cane sugar, it just tastes good to me and doesn’t make me crave more. Therefore, my advice — nothing earth shattering — is to avoid refined sugars as much as possible (or altogether) and to consume sweets containing whole cane sugar as an occasional treat. Good to know: “Evaporated cane juice” (even if it’s organic) and “turbinado” fall under the category of refined sugar. The fancy names are intended to make them sound healthier, but they are not. 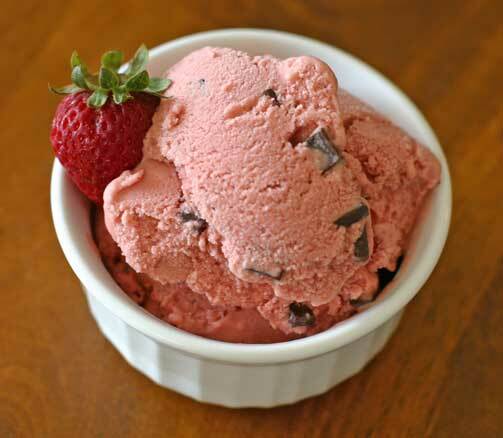 3 Responses to "Strawberry Chocolate Chip Ice Cream"
Sold!! May even try it tonight. So, I have a soft serve ice cream maker…what do you think? It is a Cuisinart…I may have to attempt it!! I’ve never used a soft-serve ice cream maker before, but I just watched a short video, and the inner workings of the machine sound like they’re pretty much the same as a standard ice cream maker. If you try it, please post to let everyone know how it went! This is the first time I’ve seen your blog, and I am impressed! 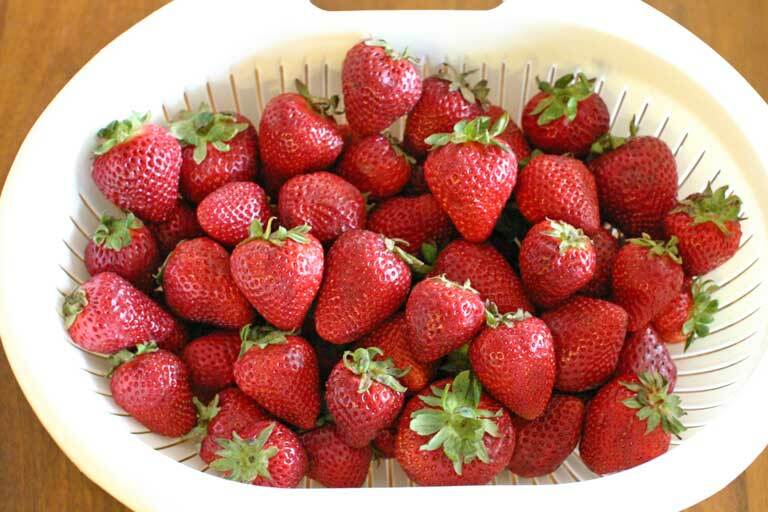 Macerating the strawberries first is such a good idea, I’m totally trying that. Yum yum!